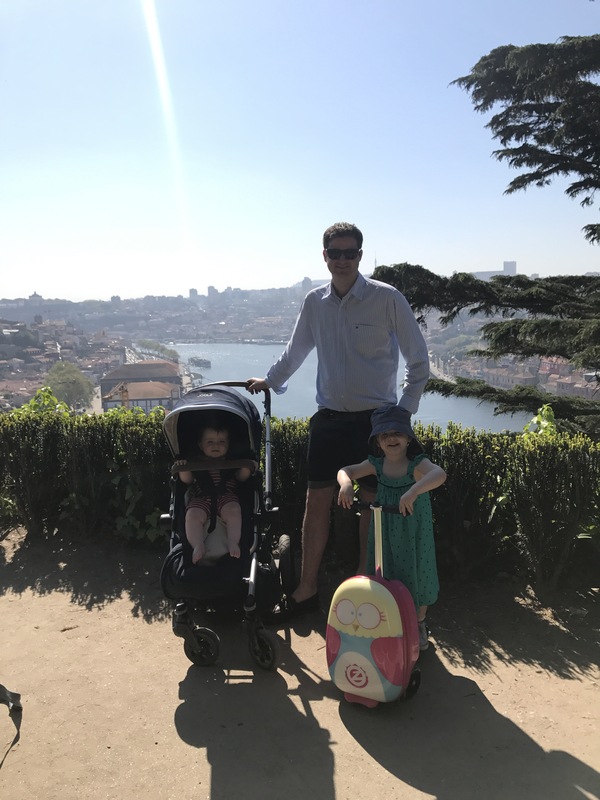 We’ve just returned from a lovely 5 night break in Porto (I’ll say more about this soon!). In preparation for this trip we got our daughter a Flyte bag and we planned to take this instead of her Trunki. We got our bag from Argos, but they are also stocked on Amazon . There was only two designs available when we purchased ours but I did notice that the Flyte website had loads of funky designs but many of them were out of stock when I was looking. We opted for the midi size (it is currently offered in mini and midi size) for our 3 year old in the Owl design (the bag is now affectionately known as ‘owl bag’). Our daughter coped perfectly with the size and I guess there is also room to grow! So we’ve only taken the bag away on one holiday (so far!) but here are our thoughts on the pro’s and con’s of the bag. We found the capacity of the bag far better than her Trunki. We have, for example, always been unable to fit our daughters Usborne sticker books and favourite Julia Donaldson books into her Trunki (cue them taking up space in my bag!). The ‘owl bag’ was easier to pack and held everything (and more!) than she needed for our time away. The soft top to the bag meant that it also fitted more easily under the seat on the plane. Again we’ve always found the Trunki a bit awkward when flying. Not only is it near on impossible to fit under the seat it is also fairly tricky to open the Trunki up mid-flight when under the seat (and when you desperately need access to a certain colouring book this is not ideal!). Once we’d arrived in our destination and when we took the bag out for the day we liked the fact that the bag doubled up as storage for all the bits and bobs you need when on a day trip with children. The price is considerably more than the Trunki (even with my £10 reduction it was £54.99). 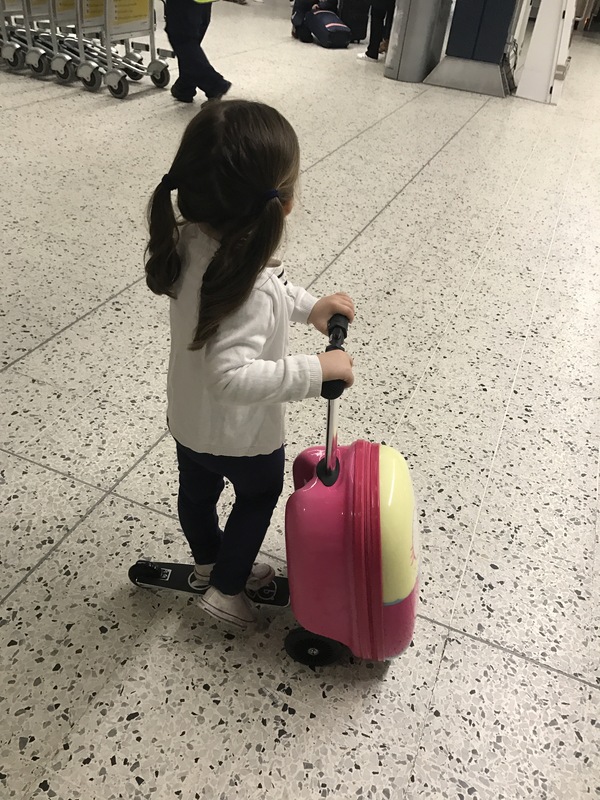 So it’s a fairly pricey luxury for a child……but if it makes travel easier than I’m all for it! Whilst the scooter bag was incredible in the airpot I wasn’t totally convinced by its use whilst on holiday. This would obviously depend on where you were going and the kinds of terrain you were exposed to! On this occasion, we found ourselves in a particular hilly city (Porto) but that wasn’t really the issue. 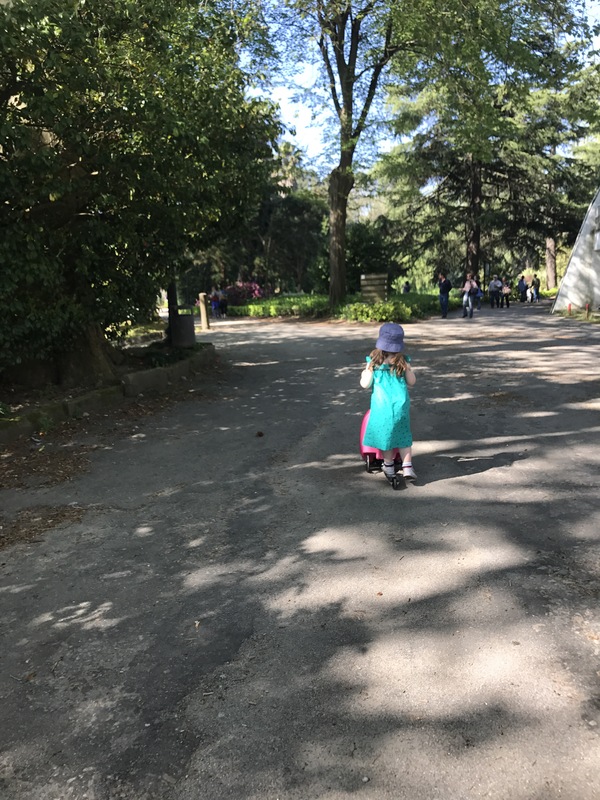 The parks, quite typically, were not tarmacced and our daughter struggled to scoot over the slightly bumpy surface (although she may have struggled with any scooter to be fair!). She did have more success on tiled and paved areas, and it has to be said that she really enjoyed having her scooter on holiday and it just meant that we, as parents, had to be more organised in arranging scooting opportunities. The bag wasn’t particularly easy to transport around, in between scoots (if that makes sense!). It is reasonably heavy and just a bit bulky to carry on and off trains, especially given that we also had the pram with us! If it had a shoulder carry strap it would be perfect – it has no other handles other than the scooter handles. All in all, we are now converted to the scooter bag, it is far better than her Trunki in an airport setting. However, we won’t be getting rid of the Trunki just yet as it is a firm favourite on trips to grandparents! Whilst I’m not totally sold on the scooter’s functionality once in the destination I do think that most children would enjoy the option to scoot on holiday (our daughter certainly did!). This post contains affiliate links which means if you make a purchase I get a little bit of commission. Thank you! Previous postTV on tablets – what does and doesn’t work abroad?! ?